Israeli Prime Minister Benjamin Netanyahu reassured attendees of the American Israel Public Affairs Committee's annual policy conference that Israel and the US are "like a family," saying "our alliance is strong." Netanyahu brushed off any criticism of the congressional address as he thanked both Democratic and Republican members of Congress for their consistent support of Israel. Netanyahu said that in his Tuesday speech before Congress, he would not attack US President Barack Obama, a man Netanyahu said he had much respect for, as well as the office of the US president. Israel should always remain a bipartisan issue, he added. “Working together has made Israel stronger. 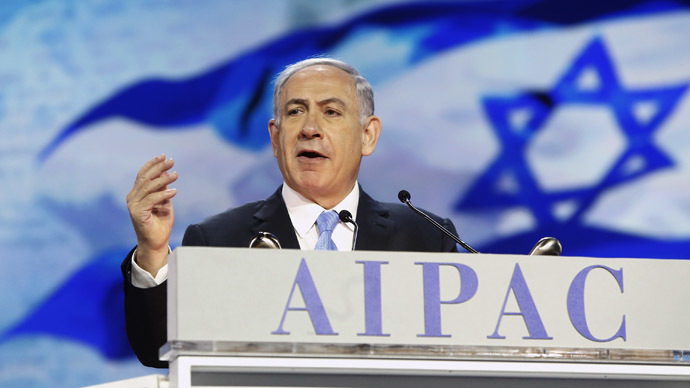 Working together has made our partnership stronger," Netanyahu said, in part a nod to the work AIPAC has done in recent decades to build support for Israel in Washington. Views of Netanyahu among Americans are generally positive. A new Gallup poll found that 45 percent of American respondents said they view Netanyahu favorably, while 24 percent view him unfavorably. Sixty percent of Republicans were positive about the prime minister, as well as 45 percent of political independents and 31 percent of Democrats. A new Pew poll also reported strong favorability for Netanyahu among Americans. A new Wall Street Journal/NBC News survey, meanwhile, found that 48 percent of respondents said Republicans on Capitol Hill should not have invited Netanyahu to speak to a joint session of Congress without first notifying President Obama. The Israeli prime minister has said he believed the “two-party leadership” of Congress had invited him, but congressional aides said they knew of no congressional Democrats who had been consulted, according to reports. Several congressional Democrats have said they would skip Netanyahu's Tuesday address, according to The Hill. Those members include civil rights pioneer Rep. John Lewis and Sen. Patrick Leahy, who called the scheduled speech a "tawdry and high-handed stunt." Many objectors said the speech was nothing more than a campaign booster for Netanyahu, as he faces reelection at home on March 17. “I intend to watch his speech about Iran from my office, but I have strong objections to using the floor of the United State Congress as a stage for his election campaign — or anyone's for that matter," Democratic Sen. Martin Heinrich said in a statement. President Obama, meanwhile, has refused to meet with the Israeli PM during his visit, while Vice President Joe Biden and Secretary of State John Kerry are both abroad. Last week, Netanyahu came under fire from Washington’s UN envoy Samantha Power and National Security Advisor Susan Rice, who both decried his decision to speak at the Congress without the official permission from the presidential administration. Kerry has warned against public discussion of the ongoing nuclear talks between the US and Iran as part of the P5+1 negotiating group, as this might damage the process aimed at preventing Tehran from developing nuclear weapons, AP reported. “We are concerned by reports that suggest selected details of the ongoing negotiations will be discussed publicly in the coming days,” Kerry said from Geneva on Monday.